Are you getting rid of your android battery life? here you can find some usefull to make your android battery live more longer. Among the main problems faced by users of smartphones is battery life levels, more sophisticated specifications of a smartphone, more and more resources are needed. Honestly, how much time does your smartphone battery able to survive before recharge? How many of my fellow readers that carry the charging cable into the Office? If your are in the stage where cannot far with the charge, it's a sign that your smartphone battery problems are serious. For users of Android smartphones, below my kongsikan Tips and how to save money using the default Android Battery systems available on a device that only requires a slight touch. Use of Wi-Fi, Bluetooth and GPS are among the most widely used functions battery resource. Make sure you only turn on this functionality when needed only. Many consider the use of charging cables can be used as you wish, as long as the battery may charge roughly OK. Make a note that any charging cable that was included with the specification that allows especially has the level of flow of electrical currents and the pin. Make it a habit to use the charging cable that was released exclusively for a smartphone to avoid ill effects in the long term. In addition it can save battery usage, awareness is also important to protect your gadgets from the results of your investment. 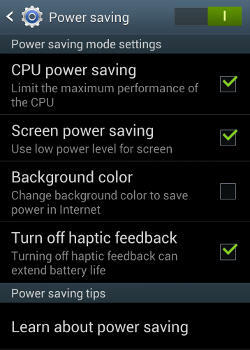 This functionality can be accessed through the notification Bar or (Setting-> Power Saving). You can specify the desired mode or allow by default. By default the Background Process Limit is set to the Standard limit. 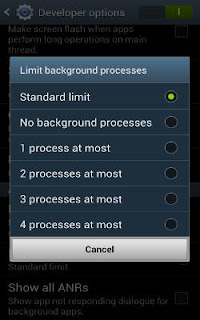 You can setkannya to No background processes. (Settings-> options-> developers ' Apps). Note: these Settings can cause your smartphone's less responsive. Set the Windows Animation, Transition and Animation Duration scale OFF or setkan to scale. (Settings-> options-> developers ' Drawing). Note: Touchwiz will be more responsive and assessment battery discharging more slowly. Note: by default, usage Data does not use a lot of battery resource unless you are out of coverage area. Set the Sync function OFF, if you're using different types of email accounts (Gmail, Dropbox, Samsung Account and so on) or you can restrict the type of Sync as needed only. This Setting must be set one by one. In addition to reducing the use of the battery, it can save the use of Your data package. (Settings-> Accounts & Sync). Stock firmware released by Samsung brought in once with some bloatware, Flipboard, Yahoo Finance and Yahoo News (Galaxy S3). Each of which will operate in the background and using the batteries and resource data. To disable (Settings-> Applications Manager-> All-> click each application-> Disable bloatware). Note: the default applications are Bloatware imported in the file system by the manufacturer and are typically not used directly. In most custom ROMs, bloatware has been released by the developer. Set Screen Brightness to the Automatic and Screen timeout is lower (according to the comfort of your eyes). (Settings-> Display-> Screen). For Sound and Vibration settings, disable it all once of Keynotes, Touch Sounds, sounds, Screen lock and Auto Haptic feedback Haptic. (Settings-> Sound-> System). Aside from that I mentioned above, there are still a few more tips how to improve battery life for android smartphone which is by not using Live Wallpapers and get a spare battery.